Medieval Investigations 2015 – May 27-28, 2015 – Kathmandu, Nepal. Abstract: This survey translates the major references and descriptions of Nepal in Classical Chinese sources, both secular sources and Buddhist texts. The Chinese often provides eyewitness accounts of medieval Nepal. The Indian literature preserved in Chinese likewise provides Indian perceptions of Nepal that are otherwise not found in extant Sanskrit works. This paper is a survey of references and descriptions of Nepal in Classical Chinese sources, which extend from the seventh to fifteenth centuries. Classical Chinese was the written lingua franca for all of China and East Asia (the Sinosphere) until at least the sixteenth century. It was also the language in which canonical Buddhist works were translated into. The secular histories and Buddhist texts available to us today are immense and fortunately preserve descriptions of medieval Nepal that are otherwise unavailable in other languages. These are useful to any historian of Nepal. Here I will provide those references in full translation. The citations are not exhaustive, though they constitute the significant references to Nepal available in the extant literature, both secular and Buddhist. The dynastic histories cited below drew on various court records and smaller histories which are noted where relevant and not reproduced due to space limitations. Moreover, the major histories provide most of the same content and much more than the lesser records. Perhaps the most famous account of medieval Nepal by a contemporary Chinese monk is that of Xuanzang 玄奘 (602–664), who left China around 629 and returned in 645. He provides numerous details about Nepal from his travelogue the Great Tang Report of the Western Region (Chn. Datang Xiyu ji 大唐西域記; Taishō 2087). It is unclear if he actually visited Nepal himself, in which case the details he is providing were presumably gained from hearsay. This flammable pond is mentioned in several other sources (see below) and was clearly a notable feature of Nepal for Chinese visitors. Xuanzang does not mention it, but we are told in later sources that it is associated with Maitreya Buddha. A historical account of Buddhism, the Fozu tongji 佛祖統紀 (fasc. 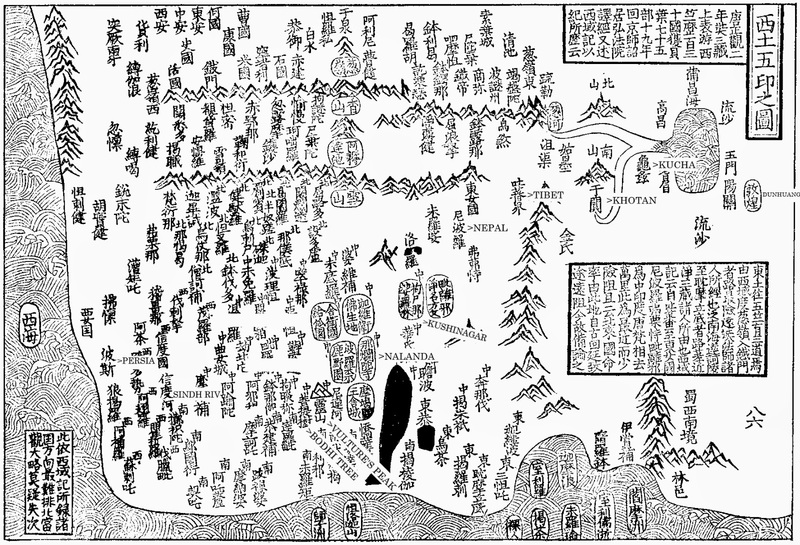 32), by Song dynasty monk Zhipan 志磐 (1220-1275) provides a map of the regions west of India based on Xuanzang's account. The map notes it is only approximate. It provides us with one medieval Chinese perspective on where Nepal is located. Note that the Himalayas are on the right, the top represents Central Asia and the bottom right is SE Asia. The sea is the Indian Ocean. The Vinaya master Daoxuan 道宣 (596-667) in his biographies of eminent monks (Chn. Xu gaoseng zhuan 續高僧傳; Taishō 2060) provides details as to the geographical location of Nepal and its customs, which seems to be extracted partially from Xuanzang's account. During the reign of Taizong太宗 [626-649], Nepal offered a śāla tree, another name being bodhi. The leaves are like safflower and the fruit like caltrop. The Chinese dynastic histories also generally include accounts of foreign countries. There were two main histories of the Tang dynasty (618-907). The first – the Jiu Tang shu 舊唐書 [Former Book of Tang] – compiled in 945 provides the following account in scroll 198 (Xi Rong 西戎). Some of it seems cited directly from the Tongdian 通典 (in section bianfang liu 邊防六), an encyclopedic work compiled by Du You 杜佑 (735-812) in 801. Nepal's disloyalty to Tibet is also mentioned in fasc. 97. The Tang huiyao 唐会要, compiled in 961 by Wang Pu 王溥 (922-982), has an article on Nepal (fasc. 100) mostly identical to the Xintang shu. It provides some additional descriptions of the above vegetables offered as tribute items. It also states that Nepal provided 7000 cavalrymen to aid Wang Xuance after he was attacked in India. The Ming dynasty (1368-1644) history (Chn. Mingshi 明史; fasc. 331) also details contacts between Nepal and China, which were significant early on in the dynasty. It is in this history that we perhaps find the first Chinese reference to Svayaṃbhūnāth Stūpa. There are also references to Nepal in Indian literature preserved in Chinese. One example is in the Mūlasarvāstivāda Vinaya Carma Vastu, translated into Chinese by Yijing 義淨 (635-713). It relates a story where Ānanda takes a trip to Nepal without any shoes in order to justify wearing of footwear by the sangha. This suggests the common Indian perception of Nepal was that it was a frigid country deep in the Himalayas. It is unclear whether this is referring to the Kathmandu valley, which has a temperate climate in reality. - Ancient relations between China and Nepal were friendly. Both countries in the Tang period had a common enemy: the Tibetan (Yarlung) Empire. The early Ming saw a resurgence of relations with Nepal, which was part of an overall Chinese plan for widespread diplomatic relations. Around 1413, it seems the Chinese were aware of two kings in Nepal. - The Chinese were particularly fascinated with the flammable pond which existed in Nepal and was associated with Maitreya Buddha. While it remains unclear precisely where this is, it is probably referring to somewhere in the Kathmandu valley. - Nepal in the time of Narendradeva hosted both Buddhist and polytheist traditions. They also produced copper and wool in large quantities. Nepalese were generally known as traders, not agriculturalists. Culturally they were similar to peoples in what is now northern India in their attire and manner of eating. - The perception of Nepal by people on the Gangetic plain – sentiments which are probably reproduced by Xuanzang in his account – was that it was a remote, cold and rugged land to the north. Xuanzang also describes the Nepalese people in disparaging terms, though the secular histories say no such things. Regmi, D. R. Inscriptions of Ancient Nepal. New Delhi: Abhinav Publications, 1983. Liao, Yang 廖旸. "Zangwen wenxianzhong de Xitian Gaoseng Shilisha shiji jikao" 藏文文献中的西天高僧室利沙事迹辑考. Zhongguo zangxue 中国藏学 no. 1 (2011): 54-63. Mingshi 明史. Zhonghua shuju ju Wuying-dian benjiao kan 中華書局據武英殿本校刊. Pal, Pratapaditya. The Arts of Nepal Volume One: Sculpture. Leiden, Netherlands: Brill, 1974. Xinjiaoben jiu Tang shu fu suoyin 新校本舊唐書附索引 (Zhongguo xueshu lei bian 中國學術類編). Taipei: Dingwen shuju, 1989. Xinjiaoben xin Tang shu fu suoyin 新校本新唐書附索引 (Zhongguo xueshu lei bian 中國學術類編). Taipei: Dingwen shuju, 1989. Xinjiaoben Yuan shi bing fubian er zhong 新校本元史並附編二種 (Zhongguo xueshu lei bian 中國學術類編). Taipei: Dingwen shuju, 1990. 1 One li is approximately 0.3-0.5km. 2 Taishō no. 2087, 51: 910.b14-24. 3 Here li 利 is probably a scribal error for bo 剝. Reading the line with the latter here. 4 This country – Dong Nü Guo 東女國 – was a matriarchal society somewhere in the Himalayas or Tibetan plateau. The Jiu Tang shu (fasc. 197) states, “The eastern country of ladies are a type of western Qiang peoples. They are called the eastern ladies because in the western sea there is also a country of ladies. It is their practice to have a woman as king.” Xuanzang states, “To the east it borders Tibet, to the north in borders Khotan and to the west it borders Sampaha.” Taishō no. 2087, 51: 892.c10-13. 5 Taishō no. 2060, 50: 450.b26-c10. 6 The name of the village in transliterated Chinese is unclear: Poluodu 頗羅度. 7 Taishō no. 2122, 53: 405.a14-22. 8 In alternate editions, lin 林 is cun 村 (village). This could be a semantic translation of a place name. 9 Unclear who or what this is referring to: Xiande zhuan 賢德傳. 10 Possibly a reference to Narendradeva being restored to power by the Tibetans. Daoxuan's Shijia fangzhi also adds after this line, “Now it is subordinate to Tibet. It also follows Vaiśālī.” (今屬吐蕃又從吠舍) Taishō no. 2088, 51: 961.b1-2. 11 Taishō no. 2122, 53: 501.c22-502.a6. 12 Taishō no. 2066, 51: 2.c2-4. 13 Taishō no. 2066, 51: 3.b11-13. 14 Narendradeva was a key figure in mid-seventh century politics in Asia: “It was during the reign of Narendradeva (ca. 645-685) that the Chinese ambassador, Wang Hsüan-tse, twice visited the Nepali court. The beginning of diplomatic relations with the Chinese emperor not only signifies the increasing authority of Narendradeva, but may have been motivated by his desire to gain official recognition from China and thereby consolidate his position. Equally cogent is the likelihood that both Nepal and China deemed it prudent to seek a political alliance due to the menacing activities of the newly elected Tibetan king Songtsen-gampo, who is said to have defeated both the Chinese and Nepalis and celebrated his victories by accepting a princess from each court. The increasing prestige of the Licchavi dynasty during this period is also attested by matrimonial alliances with powerful royal houses of India.” See Pratapaditya Pal, The Arts of Nepal Volume One: Sculpture (Leiden, Netherlands: Brill, 1974), 6. See also D. R. Regmi, Inscriptions of Ancient Nepal (New Delhi: Abhinav Publications, 1983), 201-220. 15 In Chinese the rank title weiwei cheng 衛尉丞. 16 The envoy is mentioned in Ce fu yuan gui冊府元龜 (fasc. 936), compiled in 1005-1013. 17 The Chinese transliteration here is different from above. The original court records probably provided a different transliteration. 18 Xinjiaoben jiu Tang shu fu suoyin 新校本舊唐書附索引 (Zhongguo xueshu lei bian 中國學術類編), vol. 6 (Taipei: Dingwen shuju, 1989), 5289-5290. 20 Xinjiaoben jiu Tang shu fu suoyin 新校本舊唐書附索引 (Zhongguo xueshu lei bian 中國學術類編), vol. 4 (Taipei: Dingwen shuju, 1989), 3045-3046. 21 In the Chinese there is a chu 初 (early on, beginning) at the beginning of the sentence, which should have a reign era name before it, but nothing is provided. Omitting it from the translation. 22 1 zhang 丈 is approximately 3 meters. 23 Xinjiaoben xin Tang shu fu suoyin 新校本新唐書附索引 (Zhongguo xueshu lei bian 中國學術類編), vol. 8 (Taipei: Dingwen shuju, 1989), 6213-6214. 24 Xinjiaoben Yuan shi bing fubian er zhong 新校本元史並附編二種 (Zhongguo xueshu lei bian 中國學術類編), vol. 7 (Taipei: Dingwen shuju, 1990), 4545-4546. 25 The Bu xu gaoseng zhuan 補續高僧傳 (X 1524) – a Ming dynasty compilation of biographies of eminent monks by monk Minghe 明河 (1588-1640) – tells us that Zhiguang ordained as a monk at age fifteen before leaving for Kashmir where he studied Indian (Sanskrit) phonetics under an eminent Paṇḍita. It mentions he went to Nepal (Nibala 尼巴辣) and paid his respects at a 'Diyong Baota' 地湧寶塔 (the 'Diyong Stūpa'), which is similar to the place recorded in the Ming history: Diyong-ta 地涌塔. This therefore refers to somewhere in the Kathmandu Valley. For Zhiguang's biography see X. no. 1524, 77: 372.b19-373.a20. 26 Semantically it would mean “stūpa where the earth bubbles up” – possibly the location of the aforementioned hot spring associated with Maitreya Buddha? Liao Yang identifies it as Svayaṃbhūnāth. See Liao Yang 廖旸, "Zangwen wenxianzhong de Xitian Gaoseng Shilisha shiji jikao" 藏文文献中的西天高僧室利沙事迹辑考, Zhongguo zangxue 中国藏学 no. 1 (2011): 57. 27 The Itum Bahal rock inscription from 1382 describes a Madanarāma Varddhana, who was a senior minister of King Jayasthiti Malla. 28 Mingshi 明史, Zhonghua shuju ju Wuying-dian benjiao kan 中華書局據武英殿本校刊, vol. 14, fasc. 331, p. 9. 29 Taishō no. 1447, 23: 1057.a15-b1. 30 Taishō no. 1442, 23: 738.b3-4. "Anchored at Night by Maple Bridge"
The riverside maples and fires of fishermen reflect in travel weary eyes. The sounds of late night bells reach the ferries. yet there are no noisy carriages. I ask you, how could this be so? When the mind is faraway, where you are becomes remote. At ease I see the southern mountain. and the birds flying above return together. In this is the true meaning. I would have already forgotten the words. This blog is about the Classical Chinese language, which was the primary written language and lingua franca across East Asian cultures for over two-thousand years. Quotes from various authors across the centuries will be translated and presented. Notes about various subjects and the study of Classical Chinese will be provided. The Master said, "Is it not pleasant to learn with a constant perseverance and application? Is it not delightful to have friends coming from distant quarters? Is he not a man of complete virtue, who feels no discomposure though men may take no note of him?" Blog by Jeffrey Kotyk. Simple theme. Powered by Blogger.